CINCINNATI -- Twenty years after the disco ball went dim, the skating rink at Seven Hills Neighborhood Houses will open again. The skating rink in the basement of the Findlay Street community center was for years the go-to place for West End celebrations. "When people come back, we have generations of people in this community, and when they come in here, this is a memory everyone has. 'Oh, we had that party there. Oh, we used to go there every weekend,'" Seven Hills executive director Alexis Kidd said. "It's one of the staples of the West End." 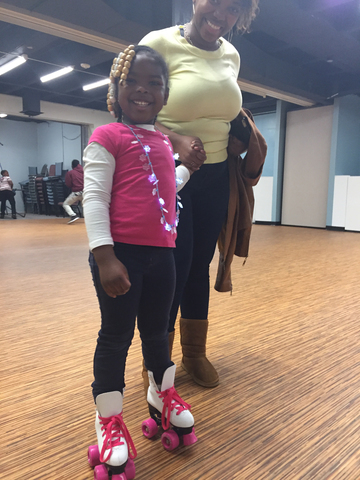 Diana Woolfolk, 4, is the daughter of Nichelle Woolfolk, who works at Seven Hills Neighborhood Houses. She said the rink will be a great way for teens to stay active and build friendships. But a water leak warped the wood floors of the rink, forcing Seven Hills to stop using it and the rest of the basement, which included a library and boxing ring. They've fixed things in stages over the last 10 years; the library and boxing ring reopened, but the rink remained closed. Until Tuesday, when Kidd and other community leaders unveiled a refurbished rink made possible by the city's Neighborhood Enhancement Program and a collection of donations from city businesses and foundations. The neighborhood program is a 90-day collaboration between the city and neighborhood organizations and residents intended to reduce crime and blight, beautify landscapes and engage the community in concentrated improvement efforts. The rink was just one part of the West End NEP, which included dozens of community clean-ups, the stabilization of 10 townhouses and a 36 percent reduction in crime over the last three months, according to city officials. The rink project alone represents an investment of more than $100,000, Kidd said. Messer Construction, which opened a corporate headquarters in the West End this fall, was one of the largest donors and also contributed labor to the rink revitalization. Led by project manager Abby Crews, women from Messer spent a day at Seven Hills building a cart to hold skates, painting walls and a new mural, creating skating guides and bringing the rink back to life. "This project was personal for me," said Sonya Walton, director of economic inclusion for Messer. "As a child, my aunt would bring us here. … We'd be right down here in this room from the moment we got here, skating and having a good time." Seven Hills still is waiting on a few safety features, including rails and pads for the walls, but Kidd expects to open the rink to the community in February. During weekdays, the rink will be available to the Boys & Girls Club and other programs that call the community center home; about 120 children use these programs each week. But the rink will have evening and weekend hours open to the public. "Our teens are excited," said Nichelle Woolfolk, who works at Seven Hills Neighborhood Houses. "This gives them another way to be active, another way to have fellowship and friendship."